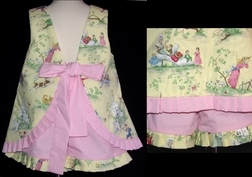 We start with the lovely yellow fairy tale toile and make a ruffled sash tie in the back swess top (2 inches longer than a regular swing top). The toile fabric is accented with a pink gingham ruffle and tie in the back on the top of the ends of the ruffle. A big beautiful bow is formed with long flowing tails. 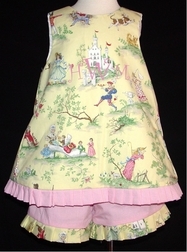 The top is paired with pink gingham bloomers, shorts or capris that can be accented with a toile ruffle at the hems of the legs.